The initials that get placed after a boat’s name can sometimes be mystifying; the Brooker 420’s XTD triplet reportedly means ‘extended’. Not its length but rather the height. With sides measuring 720mm from gunwale to chine it is definitely taller than the average 4.2 metre tinny, and all the better for it. 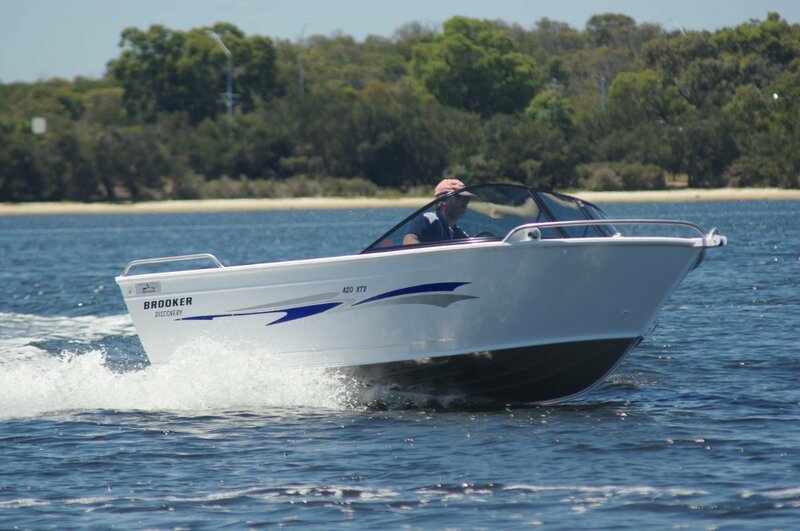 The Brooker runabout has a lot more going for it than just having the water further away. This is a well developed design; perhaps the definitive small runabout. The driving position is set far enough aft to maintain good trim, but the cockpit does not get crowded with four adults in it. The windscreen has an opening centre section, but the foredeck is short enough not to need the complexity of an indent in the dash to reach the anchor. There is a short bowsprit for mounting it, and a plastic (quiet) well for its line. Seating is straightforward. A pair of much better than basic singles at the windscreen and a transverse locker box aft with an upholstered top. This is fixed to the carpeted deck by four screws, so it is a simple matter to locate it to suit the way you work your boat – you might prefer it fore and aft. If you work with just two on board you can leave it at home. One of the delights of a small aluminium craft is the ease of getting it on and off the trailer under any conditions. The 420, with motor plus a half tank of fuel, weighs in at about 400 kilos. For handling at ramps without finger jetties – or on beaches – the foredeck has low rise grab rails around it. It is pointless to have them at guard rail height round a deck no one will ever walk on. The builder recommends a very small range of power: 30 to 40hp. We had a Honda 40 and would certainly not want any more. Performance was close to exhilarating but, probably more importantly, the likely cruising speed of around 20 knots needed gratifyingly little throttle. The 420 combines the convenience of a portable fuel tank with substantial capacity: 125 litres will take a 40hp four-stroke a long way. The tank is still small enough to tuck in neatly behind the rear lounge. Storage space is about typical for a runabout, although that rear lounge-locker perhaps ups it a bit. Side pockets and under the foredeck constitute the rest. Stuff stowed in the latter spaces tends to get a rough and damp ride; a cure for this I have made in the past was to fit a flexible shelf – a net suspended from glued-on hooks and tensioned by bungy cord. The 420 may be small - less than 14 feet in old money – but the fit-out has not been cheapened to match. The motor gets a splash well, cut down a bit to allow motor tilt; there is a boarding platform; navigation side lights are neatly integrated into the forward rails. And, also in the lighting department, LEDs have been installed under the side decks. This is a competent boat for a host of possible uses. It would be at home on rivers and inlets, on Cockburn Sound or inside the five mile reef. Generally, the smaller the boat the more use it gets – and certainly the more fun per dollar spent. As reviewed the 420XTD lists at $24,450. Deleting paint will shave $1,000 off that figure; adding a Bimini and forward clears will lift it to $25,800. As always, substituting a two-stroke for the Honda would make the economy minded smile.